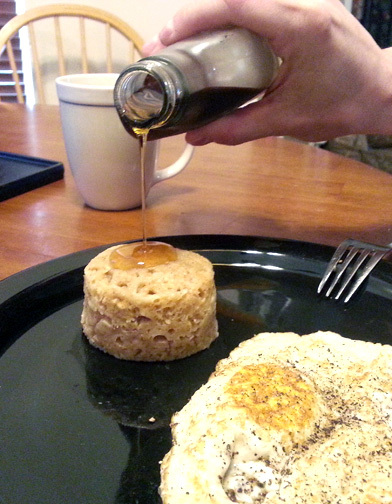 3-minute Microwave Oatmeal Cinnamon Breakfast Cake | Have YOU Ben Starr Struck? I make breakfast almost every single day. During the week, when it’s nothing special, I usually make biscuits or pancakes. Biscuits take about 15 minutes, start to finish, pancakes take a little less. That’s not a lot of time, to be honest. Way less than most people might think. But even 15 minutes is too much, sometimes, especially on a busy morning. So I developed this little breakfast cake off my Microwave Chocolate Lava Cake recipe (which is one of my most popular recipes, at least with the search engines.) It takes about 3 minutes to make, start-to-finish, and it’s baked in the microwave. The little cake that results is like an extra-moist oatmeal muffin…hearty and fragrant, and will keep you going all morning until lunch. It’s not going to win any awards for sophistication, but it’s infinitely healthier for you than something processed from the freezer, and it’s embarrassingly easy to make. I always think of my buddy Rachael Ray when I develop a recipe like this. Being on her show was such fun, and while she doesn’t claim to be a chef, I think her convenient recipes have made a HUGE difference in the lives of many people who wouldn’t otherwise cook for themselves. I also think about Alton Brown, because he’s such an amazing food geek who loves using technology to make cooking more interesting and efficient. So this recipe is dedicated to them. Place the tumblers in the microwave and nuke them on full power for about 2 minutes. This is the only tricky part, because everyone’s microwave is powered differently. So the first time or two you make this, you may underbake or overbake your cakes, but you’ll figure out your microwave’s “sweet spot” after a time or two. 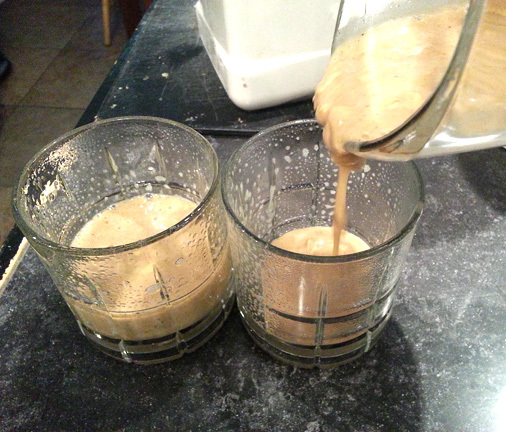 When the batter is rising and reaches close to the top rim of the glass, let it go another few seconds and stop it. (My microwave does this in exactly 115 seconds.) Let the cakes sit in the microwave for at least 30 seconds. CAREFULLY remove the screaming-hot glasses from the microwave with a glove or hot pad and invert them onto the serving plate. The cakes will drop down onto the plate. If you’re not serving them immediately, wait to remove the glass until serving time, which will keep them warm. Drizzle with maple syrup, and you’ve got the easiest homemade breakfast you’ve ever made! 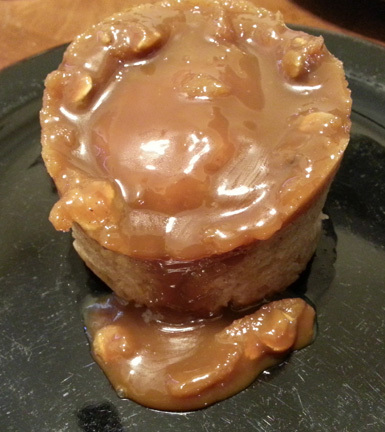 UPDATE: Take this cake up to a whole new level by adding a decadent meltdown! Just before putting the batter in the microwave, add a big spoonful of dulce de leche or caramel sauce, or any fruit jam, right on top. As the cake begins to bake, the meltdown will slowly sink to the bottom and heat up. As the cake sits in thee microwave, it will absorb some of the meltdown. When you invert the cake onto the serving plate, the rest will become a decadent sauce that will ooze down over the cake, making this easy-as-can-be breakfast extra decadent! This entry was posted in Breakfast, Quick Breads, Recipes and tagged alternative, Alton Brown, breakfast, cake, cinnamon, Gordon Ramsay, Gordon Ramsey, homemade, Master Chef, MasterChef, microwave, nut, oatmeal, quick, Rachael Ray, Rachel Ray, raisin. Bookmark the permalink. Excellent! I reduced the brown sugar to two tablespoons, and added a tablespoon each of dried cranberries and chopped walnuts. Will be making this again. Thanks! I just made these things. They’re pretty good for a ‘microwave’ food, even though I did put too much cinnamon in. I was walking back and forth to look at the recipe because I didn’t feel like printing it out, so instead of 1 tsp of cinnamon I used 1 tbsp. these are yum ! thanks ben! made them as described and they are perfect little pleasures. i love all the additional information you provide in your recipes and blogs. thats smart! double thanks!! how do you think sweetened condensed milk would be instead of dulce de leche? I just made these with rice milk, whole wheat flour and homemade vanilla extract… So dreamy. I could get excited about these any time of the day. I just finished watching season 2 of MasterChef yesterday and was pretty bummed when Ben Starr got sent home, but SO excited to find some of your recipes online! Thanks! !